"Barbecue," in this neck of New Jersey, often summons the image of a Portuguese- or Brazilian-style churrasqueira, where meats are sizzled over a grill or on a rotisserie. At Red White & Que, which I first visited several years ago, not long after it opened on a tree-lined, otherwise residential block behind a high school, the bill of fare is "American Southern barbecue" — a phrase I heard repeated to numerous first-time visitors, less for clarification than as cheerleading. The hit parade of styles includes pulled-to-order Carolina pork shoulder and Texas brisket with a fresh-cracked black pepper rub (first and second photos below). At the next table a fellow customer manhandled a rack of St. Louis ribs; an hour later, but too far away to turn back, I wished I'd made room for those, too. Also shown, from the annual Hamilton Park BBQ Festival in Jersey City: a whole hog sandwich dressed with sweet and vinegar sauces. The Pepsi privilege sign is a holdover from an older business. How old? The hand-lettered name Towne Deli (that is, "Towne" with an "e") concludes with a period — a bygone flourish that must have been in fashion within the memory of the owner, or perhaps the sign painter. The newer, more naively hand-lettered sign (for "Town" without the "e") also has a flourish of its own: The two small Chinese characters at the far right, "cheng he," mean "honest." Refreshing: a freezer case that's not filled with the same old brand names. This casual Peruvian restaurant stocks its own housemade ice pops flavored with passion fruit, coconut, soursop, lucuma, and strawberry. Mine was dense enough that after unknotting the wrapper (you might manage with deft fingernails, but I relied on my pocketknife), I could peel back the plastic and take a bite without fear of drips. Some say that lucuma (also shown in closeup; $1), a fruit native to the Pacific Coast of South America, tastes like maple. I think butterscotch. "Big" might have described the 'stache of the original owner, decades ago; the storefront is small. As a consequence, however, all the volatile, mouth-watering aromas of a good sandwich shop have been confined, and intensified, when they greet you at the door. If the proportions of the Bellybuster ($12.20) don't seem to match the hand-drawn artwork on the hanging sign out front, it's because you're looking only at the half I ate in-house; the other half was under wraps, keeping cool beside the soft drinks in the refrigerator case. The bread would be better if crustier, but the guts of the sandwich — ham, prosciuttini, cappicola, salami, mild cheese — were ample enough. Asking for "everything" added tomato, lettuce, onion, a wisp of oil-and-vinegar dressing, and a few shakes of seasoning that wouldn't be out of place at your favorite slice joint. (This venue is closed.) 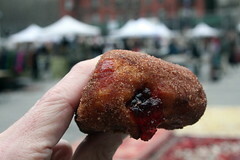 Come to think of it, rugelach is one thing of theirs I haven't had. 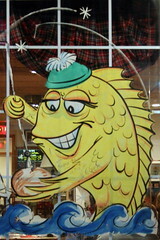 At the Argyle, even the fish sometimes turn their gaze toward the haggis. (This venue is closed.) 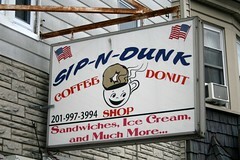 Coffee ($1), no donuts. Despite the sign and the other lingering fixtures, like footrests on the stools at the lunch counter, the menu is almost exclusively Peruvian. Nothing stood out, except for the curious display of orange gelatin desserts in the display case by the door. 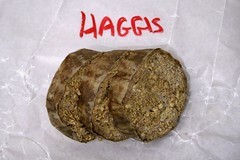 There's just not much call for haggis anymore, Al Stewart told me on a recent visit, at least not 'round here. The owner of this specialty store for Scottish, Irish, and English chow told me they still turn out pasties, bridies, and meat pies on a regular basis; sausages, somewhat less often; haggis, only occasionally. (One such occasion is before Robert Burns's birthday, on January 25.) But even plucked from the freezer, sliced haggis ($10.99 per pound) — ground lamb with beef liver and kidney, oatmeal, plus onion and other seasonings, stuffed by Stewart's in a natural casing — fries up nicely for brekkie. 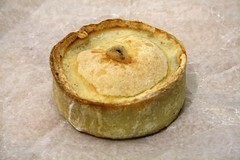 If that's not how you'd like to start your day, well, a palm-sized meat pie (below, $1.75) should do nicely, too. (This venue is closed.) Disconcertingly rectangular slab of fish in my cod and chips (lunch portion; $9), though under its batter, the fish was flaky and very tasty. 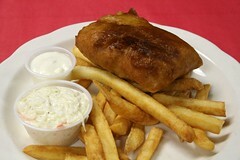 Fries were fine; the cole slaw was only slightly less liquid than the tartar sauce.